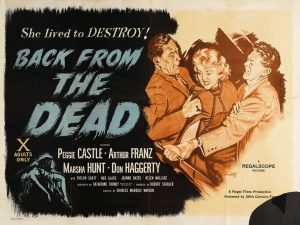 “Back from the Dead” (1957) has Marsha Hunt visiting her pregnant sister, Peggie Castle, who is married to Arthur Franz. He lost his first wife “Felicia” a year ago when she fell from a cliff. A cult of Satanists is operating in the neighborhood, which borders on the ocean and its constantly crashing waves. Castle has a first-time epileptic seizure and when she awakens, she’s been possessed by Felicia. Franz’s character mostly vacillates but Hunt is far more plucky and willing to fight the possession. Eerie music is pervasive, which the movie needs because a lot of it is talk that develops the movie’s turmoil, conflicts and struggles among the characters. There is a lot of this and it’s interesting. Still, the way that it’s done makes the movie slow at times. The screenplay and directing needed tightening up and spark in order to make this film work better. As it stands, it has some dead ends and disconnected subplots. The potential of the story is not translated fully enough into emotion and then impact on us viewers. I’d love to see this film in a good print, especially a widescreen print. This was originally Regalscope, and it deserves to be seen as such. I think that widescreen visual impact might help a lot in moving the movie along and enhancing its impact.